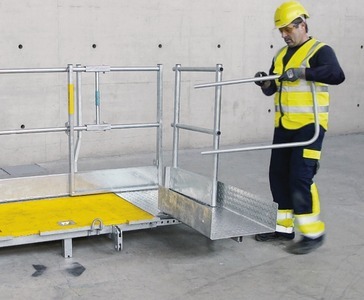 The pre-assembled, fold-out working platforms, with their integrable front/rear and side railings, ladders and self-closing manhole lids, are ready for immediate use and substantially enhance workplace safety. The system can be used on Framax Xlife framed and column formworks, Wall formwork FF20, and Large-area formwork Top 50 and Top 100 tec. This platform system can be used on framed formwork and timber-beam formwork; in each case, three different lengths of platform are available. A steel frame protects the platform decking from damage during work on the site. The integrated connection options make it easier to connect add-on components for e.g. corner transitions and closures at a later stage. 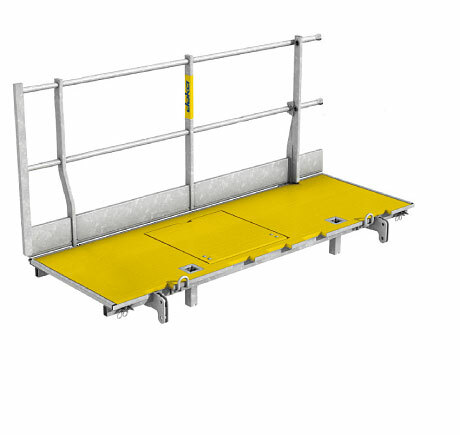 The platform can be telescoped out by up to 0.60 m on either side using the Xsafe plus platform extension 0.60m. 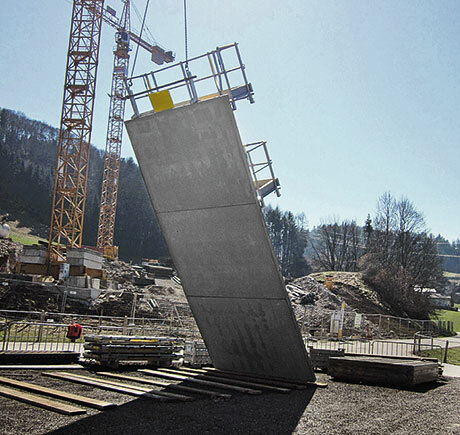 In combination with the Xsafe plus platform transition and the Xsafe plus handrail extension, this creates safe platform transitions on the narrowsides of the formwork at corners or on closure gaps. 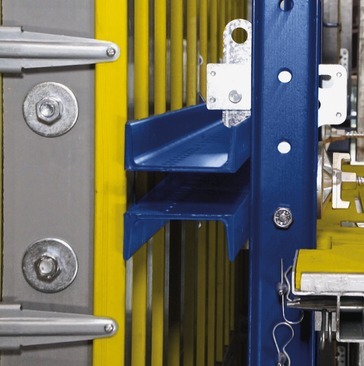 The Xsafe plus supporting strut allows the platform inclination to be adjusted by +/- 5 degrees. The work deck always remains horizontal, providing safety on inclined formwork units as well. The strut also serves to transfer the forces when panel struts are connected up. The integrable side railing provides safe working conditions and is designed for use on either the left- or right-hand side of the platform. 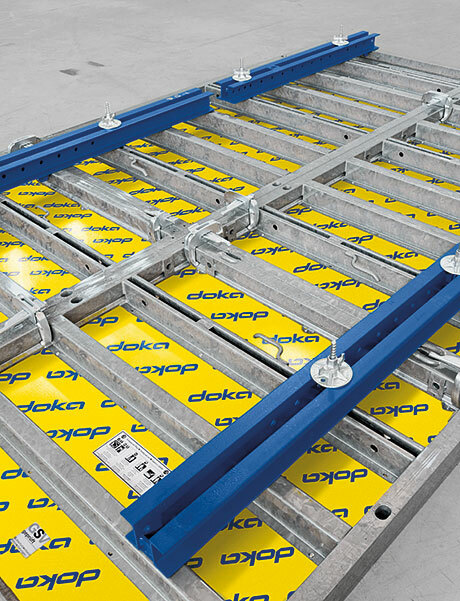 To safeguard closure gaps between two platforms, the system can be telescoped in 5 cm increments up to max. 50 cm, and moved backwards to allow unobstructed access around the platform. Thanks to the 'mounted-ahead' Xsafe plus counter railing, fall-hazard protection is already in place before anyone steps onto the platform. The side protection is thus complete on all four sides. The integrable ladder system and the self-closing manhole in the platform provide hazard-free access to the work deck. The telescoping ladder (155 cm to 271 cm) covers a large number of upright and horizontal panel combinations. The handrail extensions provide complete safety in cases where the platform has been enlarged with the 'platform extension'. 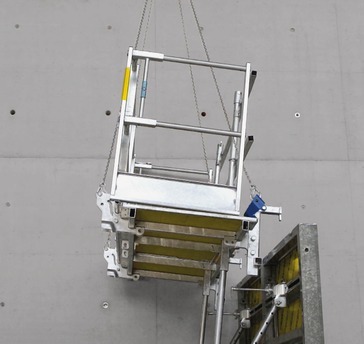 The Xsafe plus platform waling 1.50m is attached to the top part of the framed formwork, where it connects the pouring platform to the formwork. 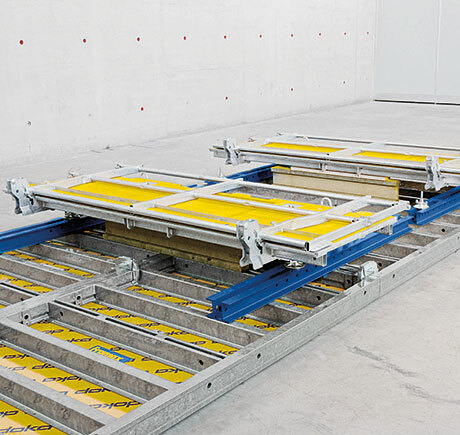 The Xsafe plus platform waling 2.10m is used in cases where panels are vertically stacked, and aligns the formwork. It also ensures that the intermediate platforms are always in the right position for operating the formwork's connecting and anchoring components. 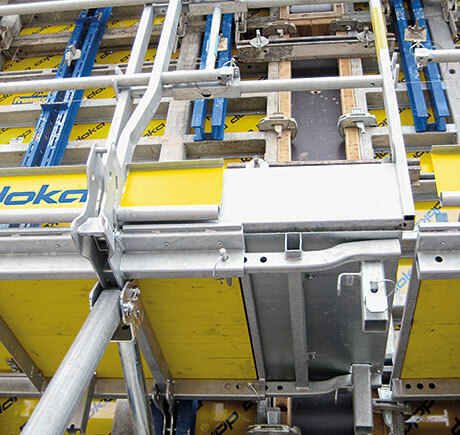 The Xsafe plus waling connector allows the platform waling or multipurpose waling to be connected to the timber-beam formwork. Safety is particularly important when columns have to be formed at slab-edges. 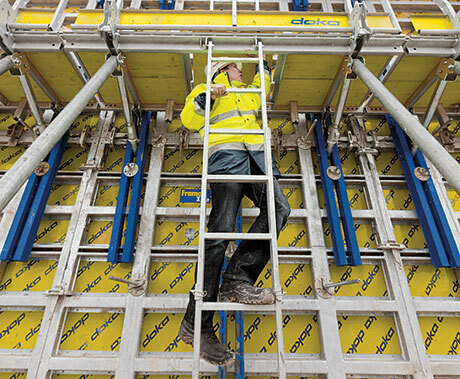 The Xsafe plus column adapter allows the platforms to be used on column formwork as well. 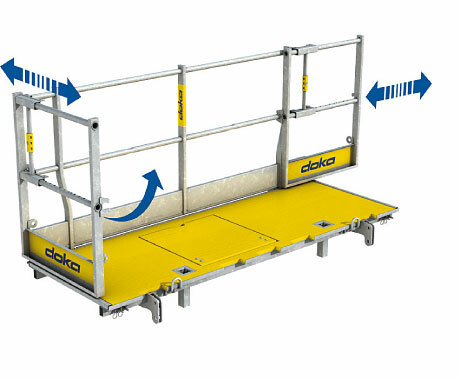 Safe ladderways and fully walkable platforms are solved within the system. 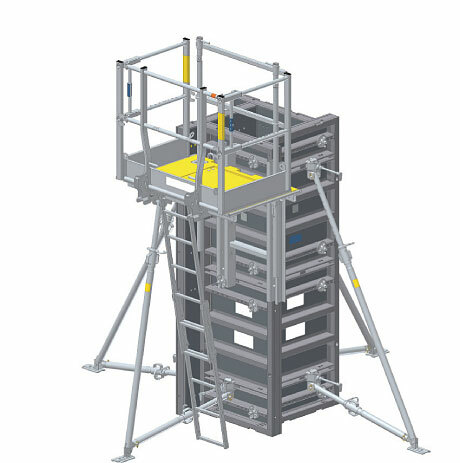 The Xsafe plus lifting adapter makes it possible to mount an Xsafe plus platform on a framed formwork unit that is already standing in the upright. No walings are needed in order to do this. With this method, the commissioning quantities for the pouring-platform level can be reduced. 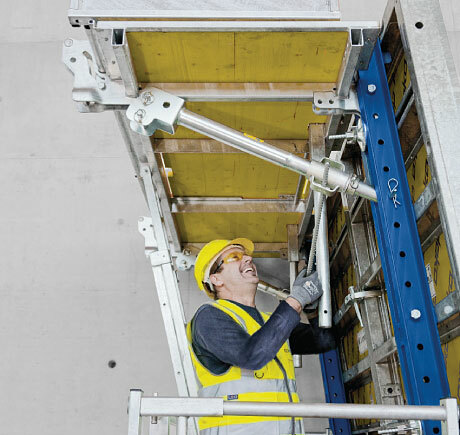 The Xsafe plus lifting waler makes it possible to lift the formwork into the upright after it has been assembled in the horizontal, and to reposition large formwork units together with the platform system. 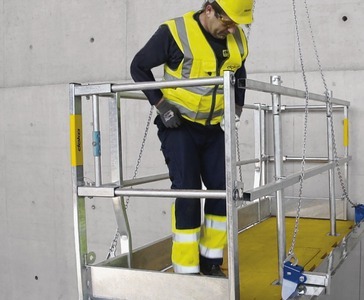 The lifting waler is CE-marked and is supplied with Operating Instructions. Where space is tight, the Xsafe plus swivel plate enables large formwork units to be delivered to the site complete with the platform system. This means that less assembly work is needed on the site. Thank you for your interest - Platform system Xsafe plus. Thank you very much for your interest - Platform system Xsafe plus.